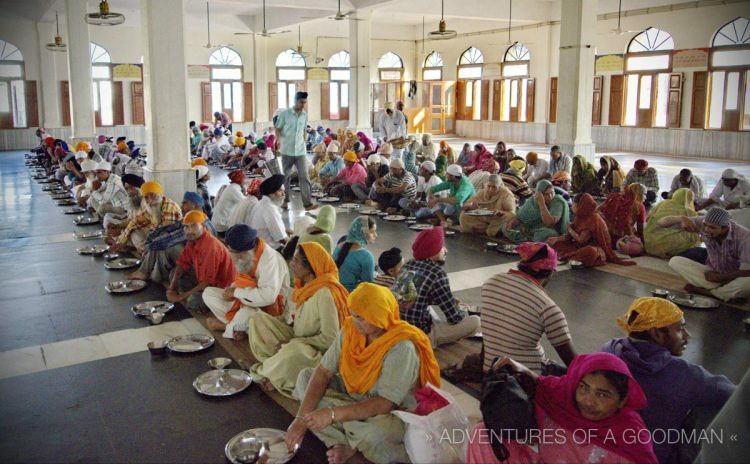 Time to feast at Guru-Ka-Langar: aka, the free communal kitchen inside the Golden Temple! Upon arriving at the front door, Carrie, Lauren, Tara and I are handed a metal plate, bowl and silverware. Then it’s inside, where we quickly sit down on a narrow sliver of track carpeting, directly across from Sikh pilgrims with big smiles. Up and down the aisles, men in turbans carry large metal buckets and take turns dropping food into our plates from waist-level. Splash, goes the daal, vegetable and raita: some of it onto my lap. The rice guy bends down a bit further with his spoon to serve us, while the chappati man will only drop his starchy circles into outstretched and palm-up hands. Fun Fact — On an average day, Guru-Ka-Langar serves 60,000 – 90,000 vegetarian meals: far more during religious holidays. Upon exiting Guru-Ka-Langar (the Golden Temple free kitchen), we saw all of our fellow diners hard at work in front of a collection of five long sinks. The girls joined a rainbow of moving saris while I headed over to the sea of turbans, washing and laughing alongside pilgrims from all over India and the world. Every few minutes, someone from the washing station next to ours would toss a new pile of dishes into our sink. As there only were a handful of sponges, most of us just used our hands to get any food off. From start to finish, each dish was washed five times, which is more than I can say for most of my dishes at home. Guru-Ka-Langar is a sprawling building with different kitchens preparing the main course, chapattis, chai and more. With the dishes done and our bellies full, all that was left to do was finally head into the Golden Temple of Amritsar!